Get up and go in these versatile trousers from Moss Esq. 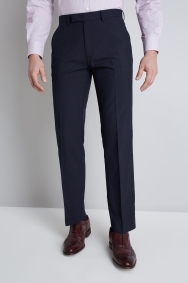 Every modern man needs a smart pair of trousers to rely on. These are easy-to-wear and you can reach for them throughout the week. Their classic navy colour complements a range of dress and business shirts and they’re cut in a regular fit for relaxed comfort. When you need to impress, step out in a crisp white shirt and the matching jacket. To soften the navy, opt for light pastel shades in your shirt and a pair of smart brown brogues. 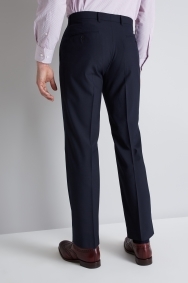 For the man who needs the freedom to be active, regular fit trousers offer a relaxed cut with plenty of space to move. The smart yet generous fit ensures you stay crisp and crease-free on the move. Tuck a regular fit shirt into these trousers for a timeless look and add a stylish jacket for the days when only a suit will do.